Plastic barrels may be functional, but they aren’t particularly attractive. By recycling them into planters, you can keep them out of landfill and make something unique for your outdoor area. In this project the owner wanted simple, inexpensive, and great looking planters. To achieve this he made planters from second hand 55 gallon food safe plastic barrels. Then. 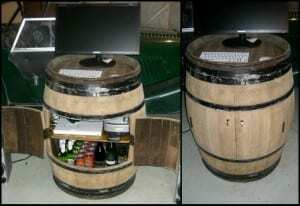 to add some pizazz, he used some scrap wood from previous projects to dress up the barrels! All in all, the project didn’t cost much. The barrels were $10 apiece in craigslist, and the wood is free. Although this project is relatively cheap, it’s difficult to ignore the amazing results. We’re on the lookout for food safe plastic barrels and scrap wood to recycle. How about you? I was able to find cheap and clean used barrels all over craigslist. I paid $10/barrel and bought two of them, one blue and one white. Using a jig saw with a fine tooth blade, cut the top off of one of the barrels. To mark an even cut line all the way around the barrel I simply held a marker in place at the height I wanted to cut at and spun the barrel around keeping the marker stationary – voila. To make two smaller planters instead of just one huge one, cut the barrel in half and DON’T cut the top of the barrel off, since that will now become the bottom. Deburr the lip of the barrel you just exposed from your cut with a de-burring tool. This step is completely unnecessary, but just something nice to throw in if you have the tool and the time. Using a decent sized drill bit (3/8″ or larger), drill many holes through the bottom of the barrel to promote good drainage. Container gardens need to drain well in order provide healthy environments for the plants that grow inside them. I wanted to raise the really big barrel off of the ground just a little bit so it would be easier to move around and position in my backyard. I did this by creating two simple skids out of 2×4’s and attaching them to the bottom of the full-size barrel with drywall screws and fender washers so they wouldn’t rip out. The next order of business was to get to work on revitalizing some old wooden redwood slats (good for the outdoors) that I salvaged from my garage. I had some other scrap wood lying around in the shop as well so I used that too. I first ran all the boards through the planer to clean them up a bit, then ripped them to varying widths on the table saw. Next, I cut them all to length using a stop-block on the miter saw. Plane, rip, chop and repeat until you’ve got a sizable pile of scrap wood to adorn your barrels. Grab an air powered brad nailer and start shooting the place up! This was the most fun part of the build process by far. Taking random boards of contrasting color, begin to cover the plastic barrel in wooden slats abutting them next to eachother as closely as possible so no blue-barrel shows through. I used a block on the bottom of the barrel to align the wooden slats so that everything would be even on the top. Continue working your way around the barrel until it’s completely been covered. Use sufficiently long brads so that you’ve got 1/2″ or so of nail sticking out on the inside of the barrel once you shoot your nail through the wood slats. Take a hammer and use it to bend down the exposed end of the brad on the inside of the barrel. This will lock the boards into place so the nails can’t wiggle out, as well as protect your hands during potting from all the sharp nails now on the inside of your planter. For the rim/top: Cut the edges of 8 short sections of scrap wood to 22.5 degrees so that they could form an octagon around the top of the full height barrel. It took a little bit of experimentation to get a perfect fit, but starting with the piece a little long and then chopping them all to the same length bit by bit, I was able to create a perfectly fitting octagon that matched my barrel. The octagon topper was held together with brads and glue, while the sunburst pattern on the shorter barrels is simply nailed into place with the brad gun. The bottom of one of my planters was originally a barrel top, and thus, it had two holes for pouring out liquids. Since these holes were just a bit too big and would let dirt out the bottom, I used some old window-screen material to cover the holes. Above ground planters need good drainage, so I put some small pebbles at the bottom of each of the planters. About an inch or so of gravel will do fine. Fill the planters with a soil mixture that’s optimized for container gardening. In this case, something with a decent compost percentage and good drainage. Plant your plants/fruit trees/vegetables into the pot. On top of the plant goes more soil to cover the roots, and a topper layer of wood chunks or mulch so that the California sun doesn’t bake all the water right out of the container as soon as I water them. Most of the slats that I used were some very old redwood shingles, so I wasn’t too worried about rot outside and water damage. That being said, hitting the planter with a coat of water-based exterior polyurethane or varnish will increase the lifespan of these planters tremendously, and if you’re in a particularly wet climate, would definitely be a good idea. I’ll probably give them a coat later this season just for safety. Place the planters and the project’s done. Thanks to noahw for this great project. 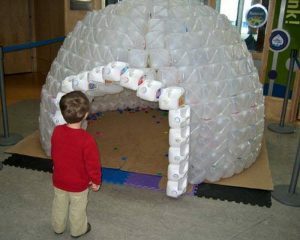 Build a milk jug igloo for the kids!